When it’s time to create marketing materials for an organization, many people seek the help of outside professionals to get the job done. In actuality, most marketing pieces are able to be designed in-house. If you need a jump start on what marketing pieces to distribute, starting with a tri-fold marketing brochure is a great idea. It can contain your company’s name, logo, contact information, services and products offered. 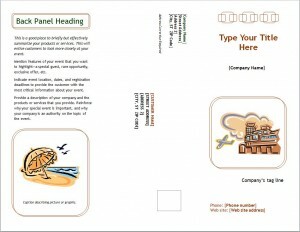 The Marketing Brochure Template is an excellent start and has a great layout for you to follow. This marketing brochure can be downloaded here for free. It has an easy layout, making it perfect to follow along. This marketing brochure is a customizable template in Word. The Marketing Brochure Template is already set up to use in a tri-fold layout. You will find some of the text is turned around and that is why. Start with some of the easy sections first. Then work your way up to providing more detailed content. You’ll notice the setup of the tri-fold has address information for your organization, the customer’s address field, as well as a section for postage. The right side of the brochure has a section to edit and add in your company’s logo. Underneath it you can add the title of the brochure. This will be the marketing piece name. Below that, you will input the company’s name, tag line, and other contact information as necessary. On the left hand side of the first page, you can place a brief description of your organization or purpose of this marketing piece. It could be to introduce a new product or service. The next page is the inside of your Marketing Brochure. Here you will input all the necessary information be it a marketing or sales piece brochure. If your organization will use this Marketing Brochure Template in-house, you can create simple mailing labels to fit in the customer address field or you can create a mail merge. A mail merge will look more professional. To do so, you will go into your “Mailings Menu” option in Word and select “Start Mail Merge”. Opt to insert bright pictures or your company logo in areas with the picture placeholders. The Marketing Brochure Template found at myexceltemplates.com is one of the many pre-designed layouts that will make your job easier.